Save Our Spit Alliance Inc (SOSA) has rejected the Jeff Leigh-Smith development plans for The Spit as disappointing, uncreative and totally ignoring the clear community vision of over 25,000 petitioners that there be No development North of Sea World Nara. "It beggars belief that developers persist in spruiking plans publicly, and presumably to the government, when they entail many things which the Gold Coast community has rejected so unequivocally", said Steve Gration, SOSA President. "The matters highlighted in last weeks' story in The Sun include a marina and commercial support services, sailing triangle and islands, all of which might sound good, but much of which is technically, economically or environmentally questionable and nothing more than a smokescreen for the taking of Marine Stadium- something which belongs to all of us." SOSA understands that the critical components of the so-called plan for Marine Stadium entail an 800 dry and wet berth marina and commercial boat storage facility, as well as associated commercial development. "If that is the case, then that plan would mean that most Gold Coasters and our visitors will no longer have free recreational access to almost all of Marine Stadium as we know it. We are being told that we should be happy just to look at rich people's boats; we should be happy that we no longer have a beautiful free open casuarina-fringed beach and a safe harbour for all people - boaties, swimmers, fishers, walkers and families - in the Marine Stadium. Not to mention the public events which presumably would be lost there - F1 boat racing, jet skiing, outrigger racing and so on" said Kate Mathews Hunt. "Gold Coasters are not that dumb to want a proposal which is in reality designed to commercially develop a public asset and to line the pockets of a few at the expense of the many. We must also dispute any suggestion that the Broadwater only appeals to a quote 'minority' of Gold Coasters or that the Spit is unused or somehow unloved; everyone knows that these claims are just simply incorrect and certainly no justification for commercial development." SOSA yet again calls upon the Government to seek further expressions of interest South of Sea World for its marina and commercial development proposals, and to leave the area North of Sea World as a world class community parks and waterways precinct. SOSA has consistently promoted a community vision for The Spit lands north of Sea World to create a world-class natural, coastal parkland and waterways precinct, one which is fully self-funded using the current lease yields from southern Spit land (estimated $10M approx) plus the yields from the 8Ha currently up for development proposals south of Seaworld. The State Government currently receives these monies. "The Gold Coast has a once-in-a-lifetime opportunity to create an extraordinary social and tourist asset - something truly world class which will see our growing population through to the next century and beyond ? the Government's current vision seems to be a prescription to lose Marine Stadium to development as a trade off for a few cheap frills attached nearby for the community," said Steve Gration. "We can do so much better and without the loss of Marine Stadium." 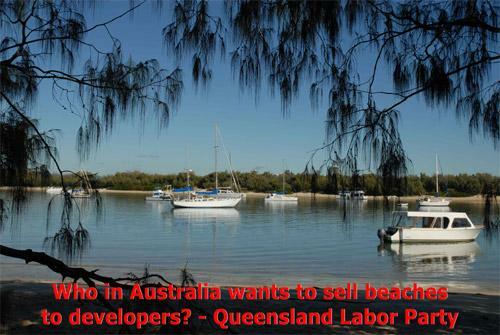 "The Spit is not a government or developer cash cow. The State Government has already stated it will enhance Doug Jennings Park and the western arm of Marine Stadium as a part of the Gold Coast Marine Development Project - we are holding them to that proposal as a positive, PLUS calling upon them to put the whole area North of Sea World off limits to commercial developers once and for all", said Kate Mathews Hunt. "It's all about a balance between the natural and built environment. There are amazing parks and natural waterways areas we could learn from around the world - benchmark the best, add our Gold Coast creativity and our beautiful natural coastal environment to create something unique in the virtual heart of our city - a planned environmental parks and waterways experience, which is a true recreational, tourist and community asset." "There is ample room for superyachts and marinas south of Nara and of course, in the Coomera marine precinct which is growing rapidly to service that projected industry opportunity more than adequately," said Steve Gration. "And as for the latest so-called plan: SOSA can only say that it's almost a carbon copy of the tired old one - give or take a cruise ship terminal or two."